Make walkies and playtime easier on your dog’s joints with YuMOVE. This all-in-one pill works in just six weeks – proven by the Royal Veterinary College – to get your pet fighting fit again. Are you noticing your dog limping, moving jerkily or standing for shorter and shorter periods of time? While older dogs are bound to slow down a bit, YuMOVE can help ease the pain in their backs, elbows and hips and get them moving again. Younger dogs can also suffer from issues like arthritis, especially if their breed is particularly vulnerable to joint problems. 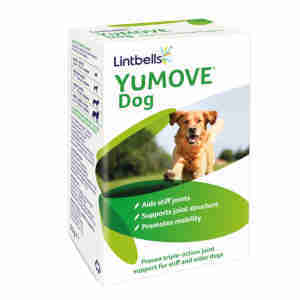 The ingredients in YuMOVE get to work quickly on your dog’s stiff joints. Omega-3 fatty acids ease sore and swollen joints, while hyaluronic acid provides some grease so that joints don’t rub together when they move. The hyaluronic acid, the connective tissue that binds the joint together, helps cartilage to grow. You can either use this supplement as part of your dog’s care routine or give it them as often as you or your vet think it’s needed. The simple and natural formula also means that you can add a tablet to their food before they start to have issues with movement. This means you can get ahead of the problem before it starts to really hurt your pet. VitaEase, Glucosamine HCI, Manganese, Vitamins C & E, Hyaluronic Acid. Our cocker spaniel had a limp so off to the vets and the anti-inflammatories worked until they ran out but the limp would not clear up so after several visits at the vets at some expense we tried YuMove. After only a week there was a marked improvement in our 8 year old cocker and after just over a month he is back to his playful self. Am continuing to give him occasional tablets to ward off his diagnosed arthritis. Whether or not the vets diagnosis is correct YuMove appears to work. My dog had a limp which i could only assume had happened on his run on the beach , i was worried it was a fracture so i took him to my vet, She wanted to x ray or scan him which i couldnt afford so a friend reccomended yumove as her dog had a similar limp with no obvious pain or swelling and has been dignosed with mild arthritis, and since being on yumove his limp has dissapeared and hes back to his normal happy self . I have had my 12 year old Labrador on these for 3 years after other dog owners recommended them. He runs around with my 2 year old Labrador with a joy of life. So grateful to have found Yumove. Couldn’t recommend them more highly. My nearly 12 year old Pointer had a degree of stiffness in his shoulder which was clearly causing him discomfort. Pain killing products caused him to behave as if he were 3 again - lovely but likely to cause more damage! I wanted something to address the actual problem rather than just mask the symptoms. He has been on Yumove for a couple of weeks now, and there has been a definite improvement. The stiffness has diminished markedly and he has been playing happily, whilst not pretending that he is a pup again! As other reviewers have mentioned, there are no problems over getting him to eat the tablets : he clearly feels that they taste fine. I am really pleased with his improvement so far. I have rated 4 rather than 5 star only because he has not been taking the tablets for very long.